Some days, you wake up suspiciously close to the afternoon and just want a great brunch to start the day. And some days, you wake up, peer out the window and decide that you would very much like not to change out of your pyjamas. Preferably forever. When those two kinds of days happen simultaneously, is it possible to be happy? Ever? OF COURSE. I am a firm believer that you never need to leave the house, brave the terrors of socializing in the morning (oh good Lord) and pay an absurd amount of money to have a great brunch. With the simplest, most basic ingredients, preferably with some fruits on hand, it’s almost too easy to fix yourself up a great brunch that you can leisurely tuck into in clothes you hope no living being ever sees you in. And so it is that I make every Saturday PANCAKE DAY. I strongly recommend you give yourself one of those days too. They are incredibly invigorating because pancakes are little circles of magic. They require only basic baking ingredients, don’t take too much fuss, and watching those little circles solidify in the pan is really rather therapeutic. The usual recipe I use is Nigella’s american breakfast pancakes recipe. I’ve tried a ton of others, but Nigella’s is the most consistent and the most tasty. I would suggest slightly reducing the amount of baking powder, though; let’s just say I once made a batch that left tongues stinging and much to be desired. This morning I popped my eyes open and thought: Saturday! PANCAKES!! Horror subsequently descended onto my half-awake self when I realised I had no milk in the house. PANCAKES WITHOUT MILK. Possible? Impossible? It is in moments like this that my old friend Google proves the most trustworthy. A quick search turned up this recipe for banana oat pancakes, that, miraculously, needed neither flour, sugar nor, of course, milk. What?! The words healthy, easy and delicious rarely sit together in my mind, but this one did blow that belief out of the park. For the full list of ingredients and recipe – you basically blitz everything in a blender, really – find them on the original website, simply-delicious-food.com! The food photographs are also incredibly well-taken and are bound to leave your mouth watering. Wanna take up my suggestion on pancake day now? So the recipe portion was for two, so I halved it. Which made me two roughly palm-sized pancakes. Which, to me, was a rather sad portion size. I normally have an entire stack to myself. 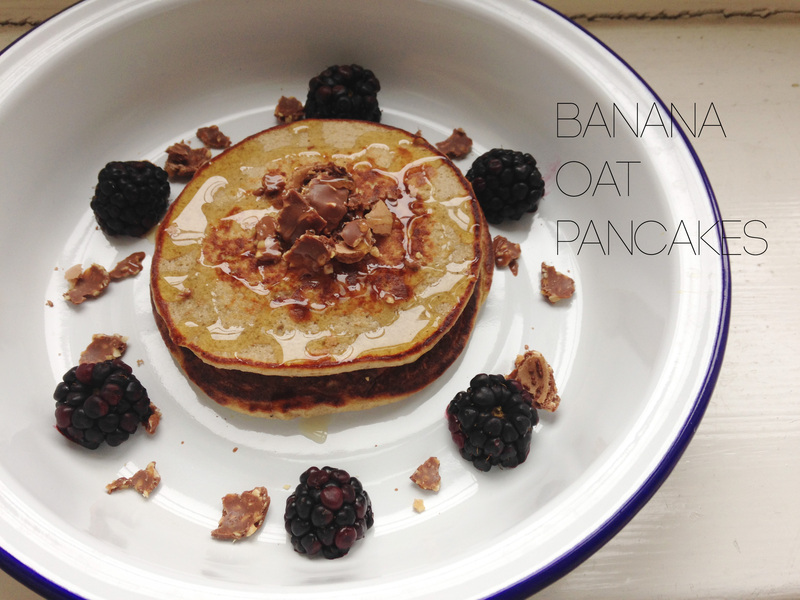 Surprisingly, though, these left me fuller than I’d expected: don’t forget that its oats you’ve got in there and those are big-time tummy-fillers! I did mine up with crushed Ferrero Rocher and juicy blackberries, drizzled with honey. Once again, proving the powers of improvisation. It was a delicious brunch. The pancakes were a great, even consistency, fluffy enough and subtly sweet from the banana, the Ferrero was, well, the Ferrero, and the blackberries were plump and tangy. You also get the fun of sponging the delightfully purple blackberry juice up with your last bites of pancake. Altogether it was a combination I HIGHLY RECOMMEND.